No, Lucius Fox is not the next Transportation Secretary. How awesome would that be? 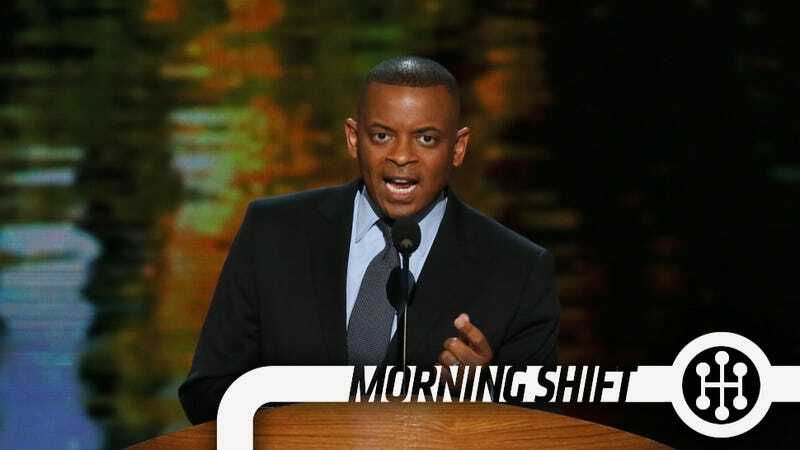 Instead, we get the much younger and less fictional Anthony Foxx, currently the mayor of Charlotte, North Carolina reports Bloomberg. Hurray? Obviously, Foxx is already more qualified than the outgoing Ray LaHood because he's had to, at least nominally, be in charge of a city's transportation system. Also, we have no evidence of him being completely terrible. Foxx's greatest accomplishment is probably the Lynx Rapid Transit light rail line (and the credit he can take for it is debatable), a system that was highly opposed as being a waste of taxpayer money before it launched. Unfortunately for opponents of the system, it opened in late 2007 which was basically the best time imaginable to begin such a service (high gas prices, tanking economy). Ridership vastly exceeded estimates and even opponents had to admit the system was a success. We're very pro public transit here so we're hoping Foxx focuses on that instead of the nonsense that LaHood seemed to bother himself with. Of course, this is all pending Congressional approval. 2nd Gear: Is The Car Radio Dead? A report from Karl Henkel in today's Detroit News takes a look at the in-dash radio, which started in the '30s but is starting to lose favor to satellite streaming and Internet radio. The in-dash car radio, with its dials and knobs, isn't signing off yet. But it's past its prime in the eyes of some automakers, and most aren't prepared to spend much time or money tinkering with it. Instead, they're focusing on the next generation of in-car entertainment, such as Web browsing and music streaming. Startup automaker Detroit Electric plans to be the first without a radio when it rolls out its first car in August — audio will be delivered via smartphone. The redesigned 4Runner was a bit of a miss for Toyota, being neither the big luxo-offroader the old 4runner had become nor being quite the lightweight off-roader enthusiasts wanted. Sales are still dramatically down from the heady, wasteful days of the mid-2000s and apparently Toyota thinks the solution for now is to butch it up with a mid-cycle refresh. Personally, I never had any issue with the way the new 4Runner looked. I thought aesthetically it was a nice improvement of the bulbous outgoing version. This new version is a further step towards cementing the 4Runner as a more off-road focused vehicle than the crossover-y Nissan Pathfinder and Ford Explorer. We have a long history covering BYD and all its Facebook weirdness and wild test drives, so we're happy to see the promise of bringing cars to America this year (which has happened every year since 2009) might actually happen. Instead of a car, Bloomberg says the partially Warren Buffett-owned automaker will try to build an electric bus in the United States. The BYD K9 will apparently be built somewhere in the U.S. and use the company's proprietary iron phosphate battery, which means it can travel 155 mile on a charge and recharge as quickly as three hours. We really want to test drive that. Someone at BYD please make this happen. According to The Wall Street Journal, Fuji Heavy Industries will recall 10,137 of the 2014 Subaru Forester over faulty floor mats. Apparently, the floor mats weren't manufactured properly, which could lead to mats that may deform and curl and thus interfere with the clutch/brake/gas pedals leading to unintended acceleration and, if pointed at a truck carrying fireworks, the potential for… fiery death. On this day in 2004, the last Oldsmobile comes off the assembly line at the Lansing Car Assembly plant in Michigan, signaling the end of the 106-year-old automotive brand, America's oldest. Factory workers signed the last Oldsmobile, an Alero sedan, before the vehicle was moved to Lansing's R.E. Olds Transportation Museum, where it went on display. The last 500 Aleros ever manufactured featured "Final 500" emblems and were painted dark metallic cherry red. Neutral: Should Oldsmobile Be Revived? Did Olds perish too soon, or was its death inevitable and healthy for GM? Would you want it back?